Preheat the grill to medium-high heat. Lightly drizzle mahi mahi fillets with olive oil and sprinkle a pinch of salt and pepper on each fillet. Place fillets on the grill and cook for 3 minutes. Rotate the fish 45 degrees (quarter turn) and cook an additional 2 minutes. Flip the fish fillets over and repeat the whole process. To make the pico de gallo, combine diced watermelon, tomatoes, white onion, cilantro and jalapeno in a bowl. Gently stir together. 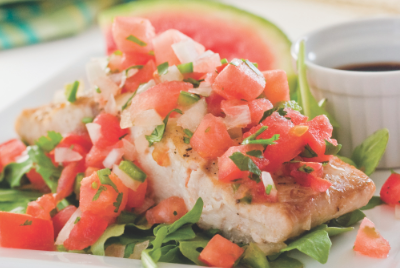 Serve mahi mahi fillets topped with a generous portion of pico de gallo.